Internet video is gaining the attention of nearly every business concerned with consumer activities, as indicated by results from Accenture's recent report on Video-Over-Internet. The global management consulting, technology services and outsourcing firm conducted a global online survey of more than 6,500 consumers around the world across major geographies (United States, United Kingdom, Australia, Brazil, Germany, Italy and Spain). Nearly everyone is watching online video. "The fact that 85 percent of people ages 18 to 24 are Internet video consumers is hardly surprising. But even among consumers over the age of 65, two-thirds of our survey respondents are joining the Internet video movement. And 82 percent of those in one of the most important demographics to advertisers (ages 35 to 44) are now accessing and interacting with video over desktops, laptops, Internet connected TVs and mobile devices." This is big news, and dispels the myth that only millennials are the ones watching video online video, and makes clear the opportunity to reach all relevant demographics for any business. All classes of video consumption devices are seeing increased adoption. 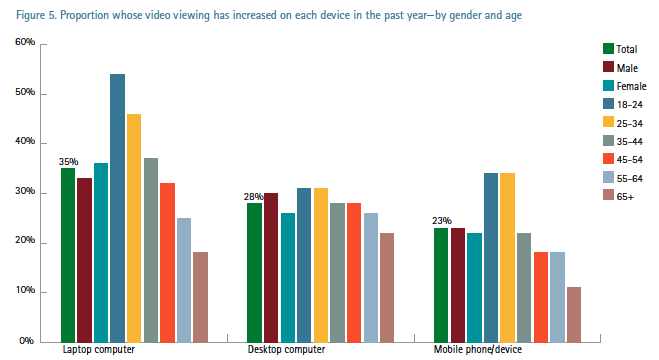 "Watching video on non-traditional devices is trending upward. In the past year, viewing increased on laptops (35 percent), desktops (28 percent) and Internet-enabled TVs (26 percent). These trends were seen across all age groups. Growth percentages for most devices were nearly identical for the 25-to-34 year old and 18-to-24 year old age groups." Multi-tasking is common. The report also begins to quantify just how much attention modes of viewers are shifting with the introduction of new streaming devices: "Of those surveyed, 81 percent said they multi-task with other devices while watching TV. Nearly half (48 percent) use a laptop while watching, 41 percent use a mobile device and 28 percent use a desktop computer." Quality is king. The report also highlights that quality is a huge concern among consumers surveyed: "Asked to name the most important technical feature of Internet TV, about half of consumers around the world (slightly higher in the United Kingdom and Australia) cited quality of service (specifically, clarity of the picture and speed of content delivery). These numbers are almost uniformly consistent across all age groups, too." My one criticism of the report is that Accenture is loose with their definitions, flipping back and forth between video-over-internet and over-the-top, and Internet-TV which refers more specifically to broadcast content online video. That and their methodology and survey questions are not easily referenced to get a better sense of how those distinctions would influence responses from consumers. Regardless, the findings are encouraging, and further prove out the consumer adoption and readiness to interact with online video of all types. For more insights, read the complete report.